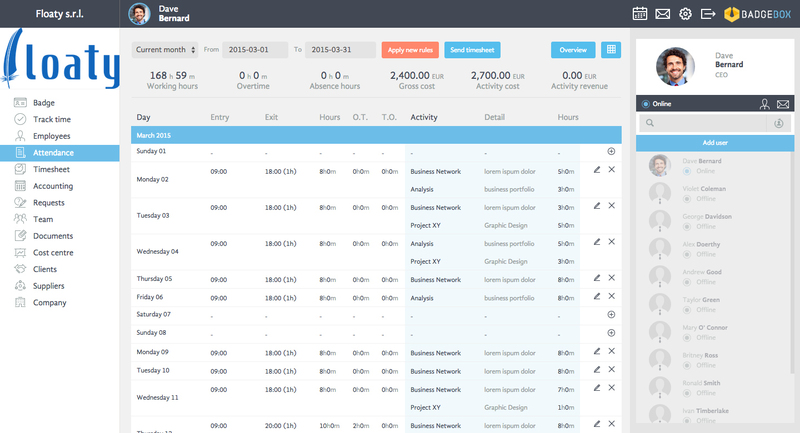 This section allows the visualization of worked hours, overtime, available time-off, gross cost of employees work time, costs and revenue of tasks or project that an employee is working on. In addition to that, it is possible to visualize all clock-in and clock-out data with the level of reliability based on the location where clock-in/out has been done. 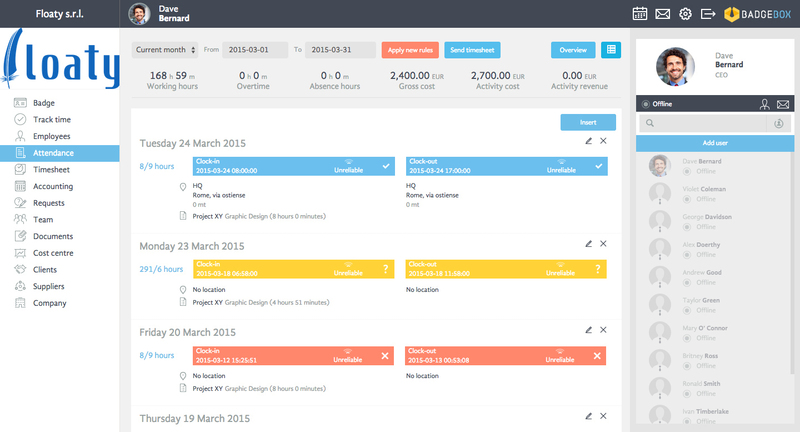 Moreover, BadgeBox allows you to select attendance data for a specific period of time, current or previous month. If the administrator enables the manual clocking, each employee can insert own working hours manually from here. This function can be enabled/disabled in the section Company. The administrator needs to select the time period for a manual clocking. For example, if the he allows manual clocking within 5 days, each employee will be able to insert attendance data manually with 5 day delay. However, it will not be possible to insert the attendance data for the period of time later than that. In order to create an attendance record manually it is necessary to click on the button "+" related to a specific day and a pop up window will open. After filling the required fields an attendance record will create for that day. Red box – clock-in and clock- out have not been performed in a work place (assigned geo location). 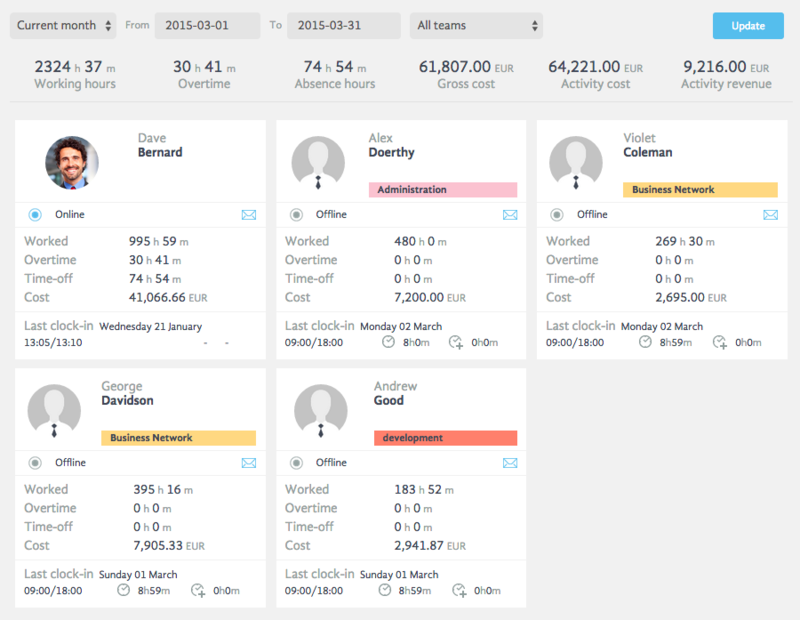 In order to facilitate attendance data management it is possible to generate and visualize attendance data for all users for a selected period of time by clicking on the button “Overview.” This function allows the administrator to visualize the summary of worked hours, overtime, reduced time, costs and last clock-in for all employees at one place.